The Fairfield Police Department is now a local representative for the Air Evac Lifeteam!!! What is the Air Evac Lifeteam? The Air Evac Lifeteam is a dedicated group of highly trained pilots, paramedics and registered nurses, standing by 24-hours a day to provide rapid medical transport to critically ill or injured people. The Air Evac Lifeteam can fly quickly to the scene of an accident or medical emergency, bringing its life-saving equipment and crew to provide immediate medical attention during those critical early moments following an accident or emergency. Traveling at speeds of up to 130 miles per hour, the helicopter rapidly transports patients to the nearest medical facility that can provide the appropriate care. The Air Evac Lifeteam works closely with ground ambulance crews to provide you with the best patient care possible. Air Evac Lifeteam was founded in 1985, and since that time has flown more than 35,000 people who were in critical need of care. Even if you have insurance, it probably does not cover all of the costs incurred on a single transport. Many insurance companies provide less than full coverage, some companies provide no coverage at all. A single emergency flight can cost as much as $7,000. If you are a member and we transport you in a life- or limb-threatening situation, we will bill your insurance company, and whatever they pay will be considered payment in full. You will not be expected to pay anything out of your own pocket. If you have no coverage for air ambulance services, you will not be billed. With a fully equipped base and on-site staff, response time to the Fairfield/Wayne County area would be approximately 10 - 15 minutes! To become a member or if you have any questions, please contact the Fairfield Police Department at 305 East Court Street, Fairfield, IL 62837 or call (618) 842-2152. What is included in the Membership Program? Air Evac Lifeteam was the first air ambulance service in the United States to offer a membership program. The membership program allows Air Evac Lifeteam to serve smaller communities that otherwise might not be able to support an air ambulance service. Air Evac Lifeteam members pay a yearly fee which entitles them to use the helicopter during life- or limb-threatening emergencies at no additional cost. Membership coverage also includes hospital-to-hospital transfers in life or limb threatening emergencies. Members have priority if two emergency calls come in at the same time. Members may use non-emergency transport at half price (emergency flights take precedent). Members may use fixed-wing services to distant clinics or medical centers at a discounted price. Members receive self-adhesive stickers for your home and automobile identifying you as a member and displaying the Air Evac Lifeteam emergency phone number. Members also receive Emergency Medical Information Sheets that will help you communicate relevant information when you contact our emergency dispatch office. We can find you when seconds count. When you become a member, we will enter the coordinates of your home into our computer navigation system. With the help of Global Positioning Systems, on board all of our helicopters, we can find your home - day or night. 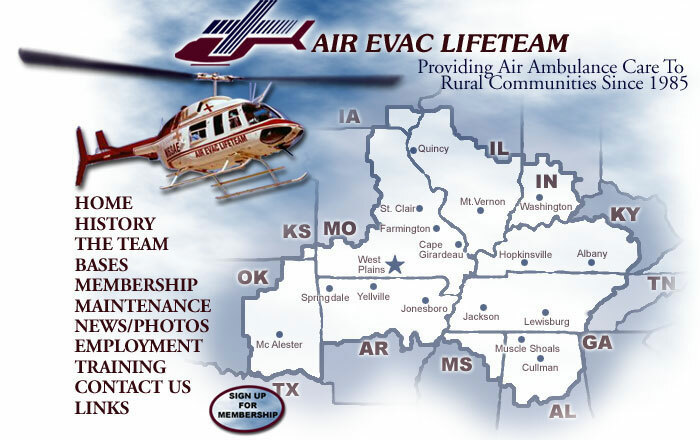 Members are covered in all Air Evac Lifeteam service areas. The Lifeteam has multiple locations with overlapping coverage areas. Whether you're in your home town, or traveling out of state, there's a good chance that an Air Evac Lifeteam helicopter is nearby.